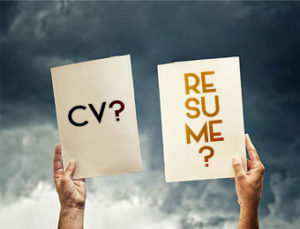 Resume or CV: Which One is the Best Job Hunt Tool for You? What Suits You: CV or Resume? When applying for a job, two documents will instantly stand out: resume and CV (curriculum vitae). These two are what employers oftentimes ask from job applicants. So, if you are applying for a job, you should definitely have copies of your resume and curriculum vitae. The resume and CV are very much like each other. Although they sometimes differ in format and presentation, they often have the same content. Because of their similarity, it is inevitable to have them mixed up. This, however, will result to instantly being rejected by your prospective employer since they will not accept petty reasoning that you’ve mixed up your resumes and CVs and brought the wrong document. So, to help you prevent mixing up your resumes and CVs, here are some useful tips. 1. Read job announcements very carefully. Some employers/companies include what type of document(s) to bring or to send to them when applying for a position. So, be alert and look for this specific information in the job announcement. 2. If no specific information is included in the job announcement, it is safe to assume that when you are in the United States, the standard document to send to the employer is the Resume. However, if you are anywhere in Europe, the Middle East, Africa, or Asia, you should send your curriculum vitae. Keep in mind that in the U.S., CV is primarily used when applying for international, academic, education, scientific, and/or research positions or for fellowships or grants. 3. When called for an interview, be prepared and bring copies of your resume AND curriculum vitae. You’ll never know what document the interviewer will ask from you, so it will be nice if you’ve come prepared and brought copies of each. 4. Place copies of your resumes and curriculum vitae in separate file holders or folders and label them. You can also use color-coded labels or folders to make it easier for you to locate them when the interviewer requests for a copy. CV and resume are different documents and should not be mixed up. Keep in mind that they have individual purposes and should ALWAYS be used accordingly.